Another newcomer.The manufacturer Galapad/Palit presents their first tablet to the market and gives it a rather unimaginative name. The hardware configuration isn't groundbreaking either, but as a complete package it could be persuasive - and it has some nice surprises in store. We've seen it often enough. An unknown manufacturer releases a new tablet with common hardware and few signs of innovation. The overall package is often disappointing, as the performance can be miserable and the software poorly implemented. We admit that as the Galapad 7 was on its way to us but not yet in our hands, we regarded it with extreme prejudice. All the greater was our surprise. We knew the little tablet contained an nVidiaTegra 3 quad-core SoC at 1.3 GHz and 1024 MB RAM, but of course you can never tell from the specs what a tablet's manufacturing quality and tactile response will be like. Does the Android system, at a recommended price of 180 Euros (~$240), have more surprises in store and represent legitimate competition for the Google Nexus 7? You'll discover the answers here. As we already hinted in the introduction, the manufacturing quality of the Galapad 7's case is exceptional. The back of the device is reminiscent of the LG Google Nexus 4 and its glass cover. Upon looking closer, however, you see that our test device is made with shiny black plastic. As a result, the back yields easily to pressure and makes a quiet, discomforting sound. 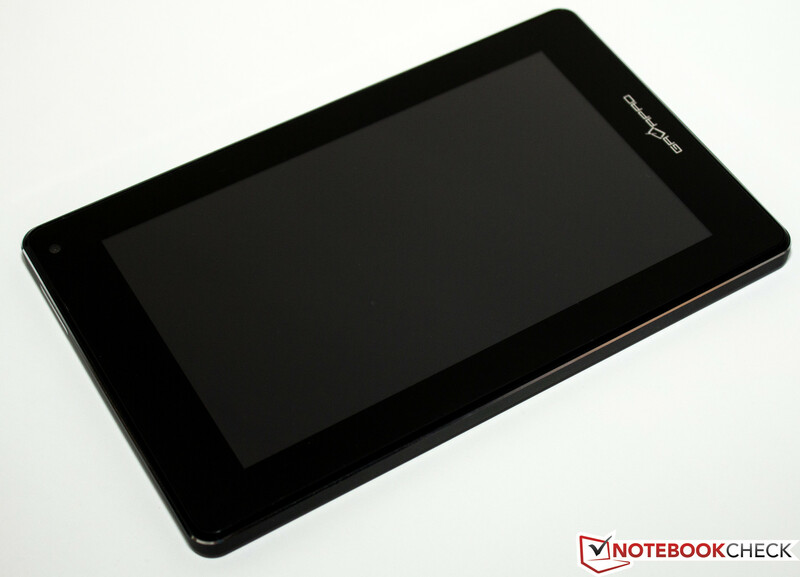 The tablet's frame is slightly raised on both the front and back and serves to protect the touchscreen and back cover. The sides of the device are made of black, matte aluminum with a silver accent. At 196 x 122 x 9.9 mm (7.7 x 4.8 x 0.4 inches) and a weight of 320 grams (0.7 lbs), the Galapad 7 is about the same size as the Google Nexus 7 but a little bit lighter (by 25 grams).